This progressive entertainment company that specializes in pairing people with live music acts for all types of events is naturally run by a group of people that love music. They wanted an open space in which to work while each needing privacy for the work of managing bands and pairing clients with those bands. 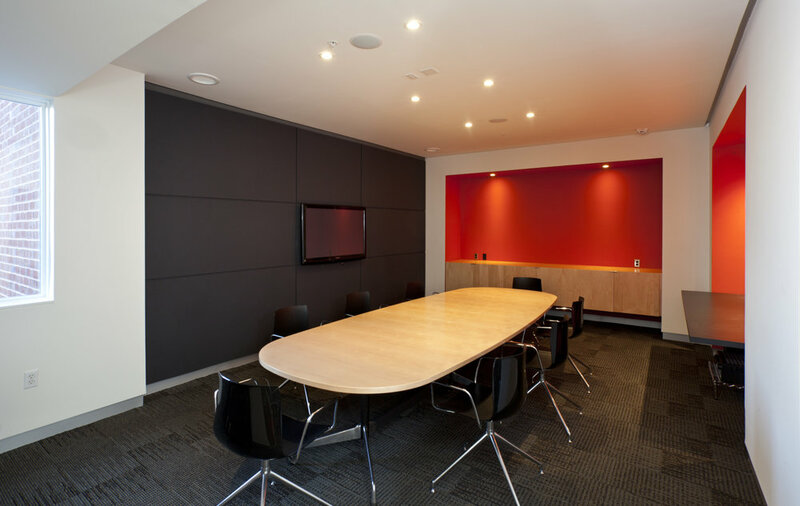 Two rooms with large glass doors bookend the large work space, the CEO's office and the meeting room. Niches carved into those two rooms for built in storage expose a deep red. That same red appears as two figures in the large work space. The first holds dead storage and is creates the entry vestibule, the second holds the break room. Collaborators and craftspeople that contributed to this project include Martin Horn Contracting, Better Living Millshop (cabinetry), Simin's Custom Sewing (custom upholstery) and Gropen (artwork and signage).